Time-lapse done with my DSLR. Trust me, it is much better looking at 1024x768 and without all the compression artifacts. The second, matching lens I was waiting for arrived today. 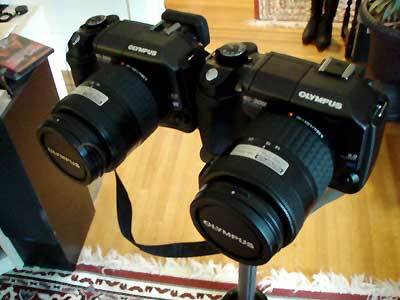 Using my flash bracket for a mount, I rigged the two identical cameras up in tandem for a test shot. They both trigger with the remote quite nicely, although, as I expected, the synch is nowhere near perfect. I could hear the shutters closing about a quarter second apart. That's not good enough for anything in motion - that's where the Stereo Realist will continue to be useful - but plenty good enough for this sort of thing and anything else where there isn't too much motion. Note that in the test Tharsis is sitting next to me. I've never managed to get a clear shot of a cat using the slide technique (taking two pictures with the same camera), so this is a definite improvement over that. Harnessing the Awesome Power of Floppies!